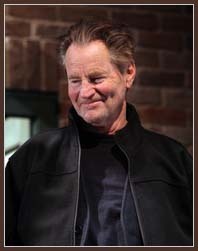 When Sam Shepard directed the original 1985 Off Broadway production of his play “A Lie of the Mind,” about emotionally scarred young men and the damaged women in their lives, the production ran six hours at first. His latest play, “Ages of the Moon,” about two emotionally scarred men in their 60s (the damaged women remain offstage) lasts about 80 minutes. Time, in other words, has started slipping away in the Shepard canon, and the playwright could not be more at peace with that. Mr. Shepard, who won the Pulitzer Prize for drama in 1979 for his play “Buried Child,” and is also the author of “True West” and more than 40 other plays, has always been a writer of economy, even when his men of few words take three acts to say them. Now, at 66, he has increasingly delved into punchy, pithy reflection, with “Ages of the Moon” - at the Atlantic Theater Company in Chelsea through March 21 — centered on a pair of friends, Ames and Byron, speaking about loss and regret from the vantage point of later life. It’s easy to imagine Shepard himself on the play’s front porch, staring into the past as the moon begins to rise. Having a new play and a major revival at the same time is an unusual experience for most writers, but it has been a profitable learning moment for Mr. Shepard: an opportunity to reflect on where he has been, and where he is today. Amid the introspection in “Ages of the Moon” is the largely unspoken but obvious role that alcohol has played in Ames’s dissipation. In the interview Mr. Shepard said he got sober in late January 2009, a few weeks after he was stopped in central Illinois and charged with speeding and driving under the influence of alcohol. He pleaded guilty a month later and was ordered to pay a fine, finish an alcohol treatment program and perform community service. These days Mr. Shepard is a grounded, hands-on presence in the rehearsal room. The actor Stephen Rea, who stars with Sean McGinley in “Ages,” said Mr. Shepard was like a technician, fine-tuning the dialogue with precision. Mr. Shepard himself describes his writing process as a composer might discuss creating a score. Both forms at their heart tell a story, through tempo and pacing and cadence, he said. In his work, conflict and violence, especially, take on an almost lyrical quality in the signature confrontations he stages among family members and friends. Neil Pepe, the artistic director of the Atlantic Theater Company, said he wanted to produce “Ages of the Moon” - the Atlantic’s first Shepard work - because he was drawn to its two characters as shades of the archetypal Shepard men who have dominated his plays for the last 45 years. In that speech Byron discloses some shocking news to Ames, then comforts himself by recalling a recent, ruminative walk around his hometown. “Magpies were squawking in the cottonwoods, and a little black-haired boy was throwing rocks at an oil can,” Byron says. Mr. Shepard is already at work on a new play, one with 12 characters that will likely be longer than the 80-minute “Ages,” but not by much. 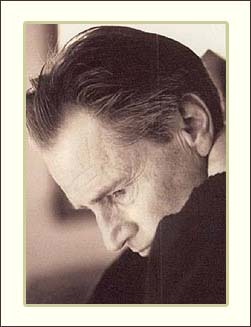 He said that “Ages” and his short stories captured where he was as a writer today, more than 30 years after the fertile 1970s period when most Shepard scholars say he did his greatest work.